With all the recent rain and chilly temperatures, the last two weeks have reminded us that as far as spring is concerned, we're still not out of the gate. (And, in fact, summer doesn't officially start until June 21st.) So now is a great time to invest in an army jacket, which is still the jacket of the season, and which you can wear through the summer, especially if, like me, you work in an office where the air-conditioning is cranked to a rather frigid level. Call it a cargo, utility, anorak, parka, or army jacket, but, basically, it's a fatigue-inspired look, preferably in army green, with lots of pockets and a well-worn look. Bonus points for a cinchable elastic waist, but in many cases, a belt will do. The look is probably best suited to casual days but also works in unexpected ways, with, say, a floral-print dress for a masculine-meets-feminine look. Here are my favorite styles. DSquared2's Polly jacket is a pretty literal interpretation of the army jacket, yet tailored with a sharp fit and finished with cool details, like the front buckle and the double-flap pockets. One would also assume that the cotton is a bit more luxe than normal. 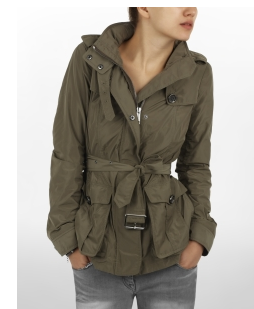 Burberry's nylon parka is actually quite utilitarian, with a zip-out hood and lots of straps and flaps. You can almost picture Kate Moss wearing this as she dashes around her country estate in the Cotswolds. It's also lightweight, making it perfect for this time of year. DKNY's long-sleeve anorak is a sportier, more minimalist take on the trend, with two simple zip pockets and elastic at the hem instead of the waist. 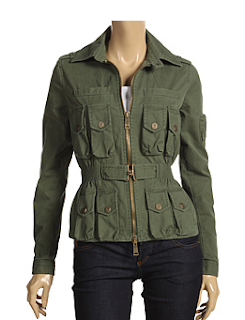 This is a great option for balancing out your figure, as the jacket skims rather than hugs. Plus, Donna Karan is a master of the anorak--it's one of her signature seven easy pieces. The bleach-splattered army jacket from Charlotte Ronson looks like something your boyfriend had for years, having spilled some bleach on it along the way, and then one day he lends it to you, but you love it so much, you have no intention of giving it back. Not that I've ever done such a thing. Rugby's cargo jacket has a snap-off hood, a drawstring waist and a snap hem, so you can kind of customize your look with it. This is a great option for petite women, since it has a slightly boxy, cropped fit. This cinched anorak from BDG has a streamlined fit that reminds me of '90s-era Jil Sander or Helmut Lang. It's nylon, and presumably waterproof, which would've made it perfect for the recent humid-rainy weather we've been having. 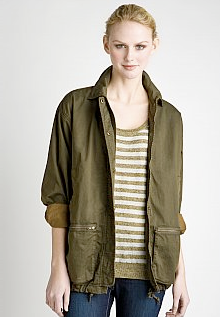 This utility jacket from Victoria's Secret is linen, which means it will be light enough to wear all summer long. 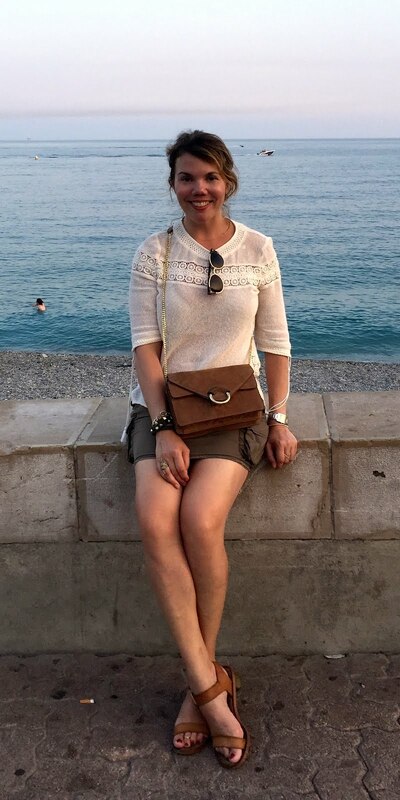 Of course, it's a bit more polished (and it comes with a belt, instead of a drawstring or elastic), but that makes it more accessible--and work-friendly--too. 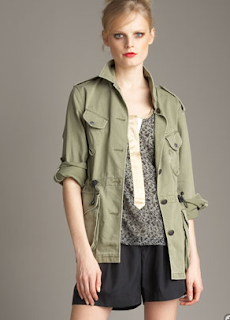 Second only to the Rag & Bone style above, however, is this military jacket from Banana Republic. (And, yes, I'm as surprised as you are.) It has everything I'm after--pockets, drawstring, length--and the very light green shade, while not exactly authentic, softens it and gives it a lived-in feel. The price is right too, which helps. I have one from Old Navy that looks just like the Banana one- a bit darker green. It was $22!